To diagnose TMD, your dentist will thoroughly examine your teeth and carry out a medical evaluation. 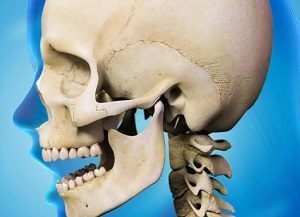 They may also take x-rays to check your jaw joint and see how your teeth bite together. Splints – these are worn to move the lower jaw forward and usually stay in place for 24 hours a day. They can help relax the muscles, protect the teeth and adjust how the teeth fit together. Night guards – these are made from a flexible material and are similar to sports guards. They are specially made from impressions taken of your teeth, so they fit securely and comfortably. In-ear device – this is an innovative and discreet device worn in the ear canal to help keep the jaw in an open position. Psychological treatments – these can be used to treat underlying psychological problems, such as stress and anxiety, which may be a cause of teeth grinding. These include cognitive behavioural therapy and other stress management techniques such as yoga, massage and deep breathing. Medication – anti-inflammatory drugs such as ibuprofen can help reduce pain and swelling. Muscle relaxants can loosen tight muscles and anti-anxiety medicine can help relieve the stress can lead to teeth grinding and clenching. Surgery – this may be considered if other forms of treatment are unsuccessful. Make sure you attend regular check-ups, so your dentist can swiftly pick up any signs of tooth wear and check the alignment of your jaws. 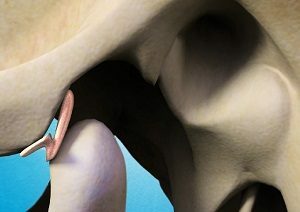 The letters TMJ are short for of ‘temporo-mandibular joint’, which is the joint connecting your lower jaw and your skull. The movement in this joint lets you open and close your mouth and chew from side to side. If your teeth don’t fit together properly, you can have problems not only in your teeth themselves, but also the gums, the temporo-mandibular joint or the muscles that move your jaw. These problems are called ‘occlusal’ problems. Loose teeth or receding gums can be made worse by a faulty bite. You may find that you clench or grind your teeth, although most people who do aren’t aware of it. Sometimes can be caused by anxiety, but generally most people clench their teeth when they are concentrating on a task – housework, gardening, car mechanics, typing and so on. If you are missing some teeth at the back of your mouth, this may lead to an unbalanced bite, which can cause uneven pressure on your teeth. Together, all these symptoms are called ‘TMJ syndrome’. 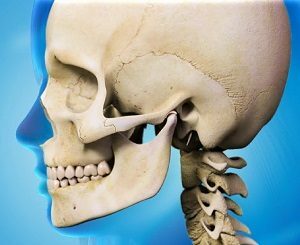 How are occlusal problems treated? See your dentist. He or she may be able to help you or may refer you to a specialist who deals with occlusal problems. Depending on the problems you are having, it can be possible to spot the signs of an occlusal problem. 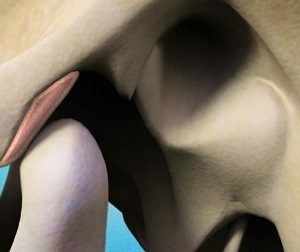 Various muscles may be sore when tested, or the broken and worn areas of your teeth will show you are grinding your teeth – a common sign of an incorrect bite. If your dentist suspects that your problems are due to an incorrect bite, he or she may help to diagnose the problem by supplying a temporary soft nightguard or hard plastic appliance that fits over your upper or lower teeth. This appliance needs to be measured and fitted very accurately so that when you bite on it, all your teeth meet at exactly the same time in a position where your muscles are relaxed. You may have to wear this all the time or, just at night. If the appliance relieves your symptoms then your bite may need to be corrected permanently. Your teeth may need to be carefully adjusted to meet evenly. Changing the direction and position of the slopes that guide your teeth together can often help to reposition the jaw. The temporo-mandibular joint needs equal support from both sides of both jaws. The chewing action is designed to work properly only when all your teeth are present and in the correct position. Missing teeth may need to be replaced either with a partial denture or bridgework. Replacement is not usually done until a diagnosis has been confirmed by using an appliance and this has fully relieved the symptoms. Relief in some patients is instant: in others it can take a long time. Some drugs can help in certain cases, but this is usually only temporary. Hormone replacement therapy may also help some women. As with any joint pain, it can help to put less stress on the joint. So a soft diet can be helpful, as can Corrective exercises and external heat. Physiotherapy exercises can often help, and your dentist may be able to show some of these to you. Counselling and relaxation therapy may help in some cases. These techniques help the patient to become more aware of stressful situations and to control tension. Will straightening my teeth help? If your teeth are too far out of line or in a totally incorrect bite position, it may be necessary to fit an orthodontic appliance to move them into a better position. Up to 1 in 4 people may have some symptoms. Both men and women are affected equally, although women tend to seek treatment more often than men. The symptoms can often start with the menopause or other hormonal changes.